Sometimes the screen can’t be repaired and it needs to be replaced. No worries – we will make that judgment for you once we’ve assessed the situation. 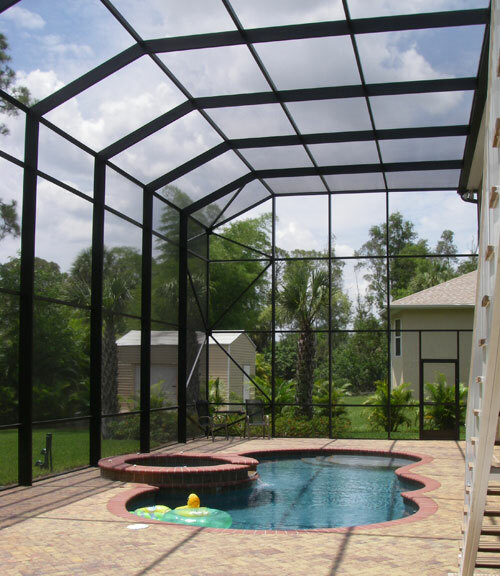 Premier professionally rescreens pool cages and all other types of screen enclosures. If you have a brittle and deteriorating screen, the screen at that point is subject to tears from objects touching the enclosure. That is often the time to re-screen your entire enclosure. Sometimes it is only necessary to re-screen certain panels. Hail damage can cause the need for partial rescreening. Partial rescreening is usually due to screen enclosure damage rather than wear. Some wear and tear occurs due to sun exposure, sprinklers, and everyday damage from use. Depending on the extent of the damage and overall area involved, we can help you make the decision as to whether a complete rescreening is necessary. When the screen has reached a point where it is brittle and tears easily, it is usually time to rescreen the entire area.